The Runner | The Great Canadian Baking Show Features KPU Physics Prof. The Great Canadian Baking Show Features KPU Physics Prof.
Canadian fans of The Great British Bake Off can now rejoice, as the show has finally made its way here in the form of The Great Canadian Baking Show. The inaugural season was shot in northern Toronto over the summer and featured 10 talented bakers from across the country. One of the contestants is a Kwantlen Polytechnic University physics professor named Dr. James Hoyland, who has taught both introductory and upper-level physics courses at the university for the past three years. Because they are originally from the U.K., Dr. Hoyland’s family faithfully followed the British version of the show. When his wife came upon a casting call for The Great Canadian Baking Show and told Hoyland, he was quick to apply. He first learned to bake as a child, but it wasn’t until 16 or 17 years ago, when Hoyland moved to New Brunswick, that he started to bake regularly. Baking breads and pastries is his specialty, and he prefers to make his bread rather than buy it at the store. “When it was snowing and -30 degrees outside [in New Brunswick] you just wanted to turn the oven on, so doing things like baking bread and warming pies [came from] a primal need for heat and carbs,” he says. On the show, Hoyland can be found furiously mixing cake batter with his bare hands, looking more like a kid playing in the mud than the distinguished physics professor that he is. Light-hearted moments like these are what separate The Great Canadian Baking Show from the abundance of high-tension cooking competitions shows on the air. 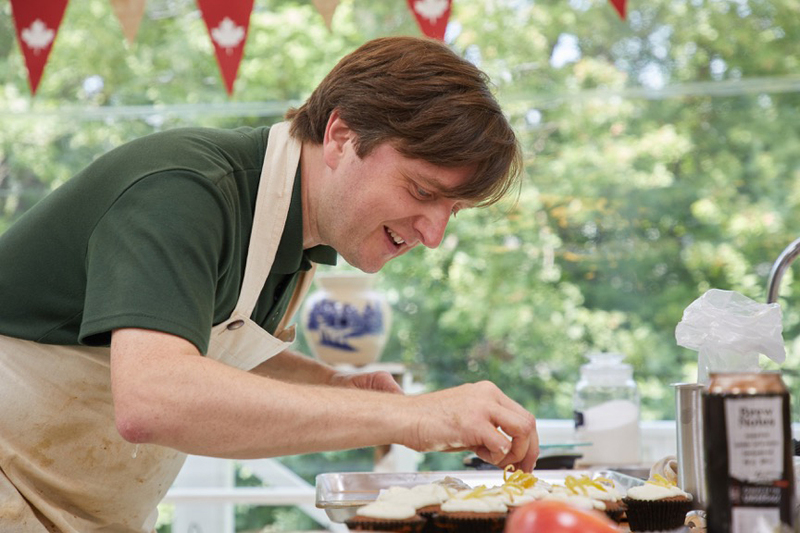 To follow Hoyland and his weekly quest to become an expert baker, watch The Great Canadian Baking Show every Wednesday night at 8:00 pm on the CBC.